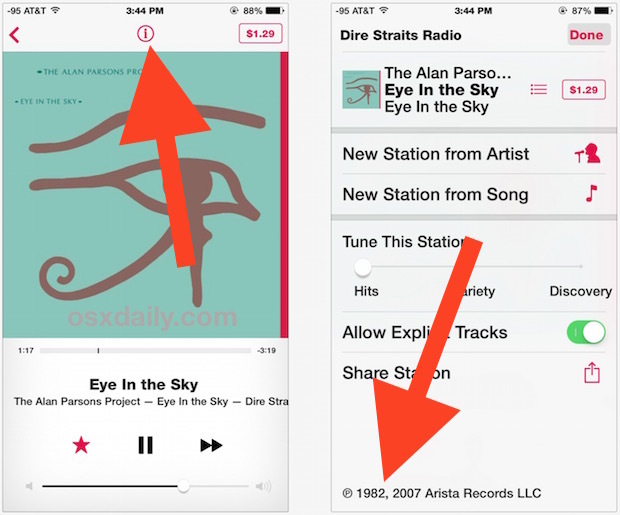 The next time you’re listening to iTunes Radio and you find yourself wondering which wonderful decade a particular song came from, wonder no more, because iTunes Radio can tell you when a song was released. Sometimes two dates are displayed, like in the example screenshot here, which is the original release date of the song, plus the date of the re-release. This is generally quite accurate, though if you’re getting information about a song that is from a Best Of list or Greatest Hits album, you’ll find the release date is sometimes listed as when that album was released rather than the original song, that’s really the only potential catch. While you’re in that settings panel you can also tune the iTunes Radio station to play hits or discovery, and to include explicit lyrics or not, that latter tip is quite helpful because excluding explicit lyrics often impacts what versions of songs are played, with the explicit toggle on you’ll be more likely to find album versions of a song playing versus a clean radio version – sometimes a single word or lyric can make that difference. This is helpful for obvious reasons, but it’s also useful to settle the debate about what year was the greatest ever for music, or just knowing when a song was actually put out. This is fun, easy to see when good music came out, if you somehow were oblivious to the 1960s, 70s, 80s being the decades of consitently good music. Then there were the dark ages of music, of maximum MTV and record label power, which brought us the 90s of absolutely terrible manure, producing nothing memorable at all. The 2000s were just as bad in the early half, if not worse, until near the turn of the decade, then the internet brought life back into music, the great democratizer of media, taking the crowning power away from MTV which only celebrated manufactured pop from attractive cultivated and manicured personas. And here we are, music is good again. We still don’t have iTunes radio in the uk! I would like to have the iTunes pull the original release dates based on the genre and artist, now that would be something worth while; especially when you are trying to create a playlist based on the year of release.